It happened. That phrase that makes all pumpkin growers cringe. You might just call it the "B" word. I hate to even have to say it, but here we go: Blosoom End Split. 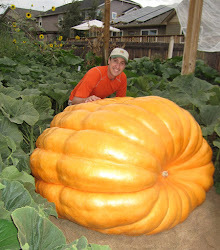 I lost the 282 Scherber pumpkin today to a blossom end split (BES). We've had a descent amount of rain over the last couple of days and it split the pumpkin open. Just too many problems this season. I'll pull the plant this weekend and plant some sorghum sudan grass to get that spot ready for next season. Mine are wimpy beach balls, can end rot happen at any time? My 301 Johnson is only about the size of a basketball. What preventative measures can I take in an attempt to avoid a similar tragedy? Ryan - rot and splits can happen at almost any time. Typically it happens 50+ days after pollination. Matt - How many days after pollination are you currently? If you are around day 25-35 you are doing okay. If you are after that I would look at if you are over fertilizing or under fertilizing or over watering or under watering. Also the size of the plant can be a factor. A good root system in good soil that isn't compacted and lots of big, green leaves will power the growth of the pumpkin. Go through my blog. It talks about everything I do in the off season and during the season. You might find some tips in there. Mine has suddenly started putting on serious weight. (Relative to what it was lol) and of course right as that started happening my cat jumped on it and put 20 holes it in. Nothing to deep just superficial punctures. Still annoying. But the warm weather is sticking around so if I can break 300-400 my first try I'll be happy. That is good news Ryan. Keep that thing cranking.